This trial film tells the story of a jury made up of 12 men as they deliberate the guilt or acquittal of a defendant on the basis of reasonable doubt, forcing the jurors to question their morals and values. In the United States, a verdict in most criminal trials by jury must be unanimous. The film is notable for its almost exclusive use of one set: out of 96 minutes of run time, only three minutes take place outside of the jury room. 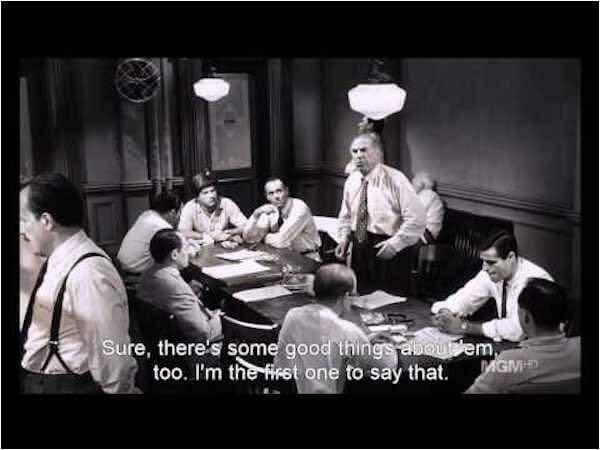 12 Angry Men explores many techniques of consensus-building and the difficulties encountered in the process, among a group of men whose range of personalities adds intensity and conflict. No names are used in the film; the jury members are identified by number until two of them exchange names at the very end. The defendant is referred to as “the boy” and the witnesses as “the old man” and “the lady across the street”. In 2007, the film was selected for preservation in the United States National Film Registry by the Library of Congress as being “culturally, historically, or aesthetically significant”. The film was selected as the second-best courtroom drama ever by the American Film Institute during their AFI’s 10 Top 10 list, and is the highest courtroom drama on Rotten Tomatoes’ Top 100 Movies of All Time.